Zafar, M. B., Valera, I., Gomez Rodriguez, M., Gummadi, K.
Vergari, A., Molina, A., Peharz, R., Ghahramani, Z., Kersting, K., Valera, I. Does universal controllability of physical systems prohibit thermodynamic cycles? Ghoshdastidar, D., Perrot, M., von Luxburg, U.
Vinogradska, J., Bischoff, B., Achterhold, J., Koller, T., Peters, J.
Kim, H., Woodward, M. A., Sitti, M.
Kloss, A., Schaal, S., Bohg, J. One of the most basic skills a robot should possess is predicting the effect of physical interactions with objects in the environment. This enables optimal action selection to reach a certain goal state. Traditionally, these dynamics are described by physics-based analytical models, which may however be very hard to find for complex problems. More recently, we have seen learning approaches that can predict the effect of more complex physical interactions directly from sensory input. However, it is an open question how far these models generalize beyond their training data. In this work, we analyse how analytical and learned models can be combined to leverage the best of both worlds. As physical interaction task, we use planar pushing, for which there exists a well-known analytical model and a large real-world dataset. 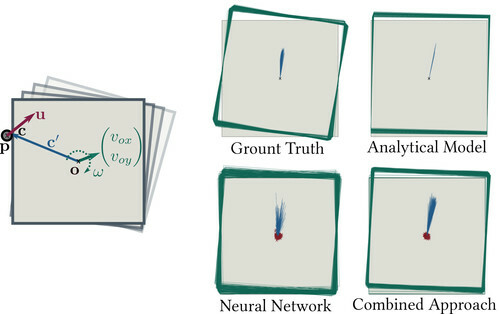 We propose to use a neural network to convert the raw sensory data into a suitable representation that can be consumed by the analytical model and compare this approach to using neural networks for both, perception and prediction. Our results show that the combined method outperforms the purely learned version in terms of accuracy and generalization to push actions not seen during training. It also performs comparable to the analytical model applied on ground truth input values, despite using raw sensory data as input. The ADAM optimizer is exceedingly popular in the deep learning community. Often it works very well, sometimes it doesn't. Why? We interpret ADAM as a combination of two aspects: for each weight, the update direction is determined by the sign of stochastic gradients, whereas the update magnitude is determined by an estimate of their relative variance. We disentangle these two aspects and analyze them in isolation, gaining insight into the mechanisms underlying ADAM. This analysis also extends recent results on adverse effects of ADAM on generalization, isolating the sign aspect as the problematic one. Transferring the variance adaptation to SGD gives rise to a novel method, completing the practitioner's toolbox for problems where ADAM fails. Liao, Y., Donne, S., Geiger, A. Existing learning based solutions to 3D surface prediction cannot be trained end-to-end as they operate on intermediate representations (eg, TSDF) from which 3D surface meshes must be extracted in a post-processing step (eg, via the marching cubes algorithm). 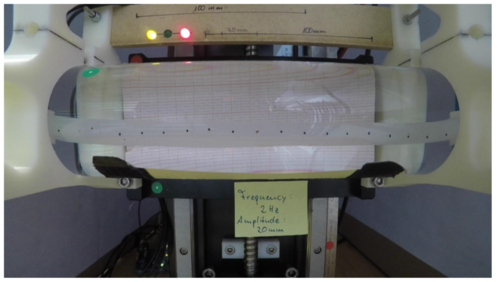 In this paper, we investigate the problem of end-to-end 3D surface prediction. 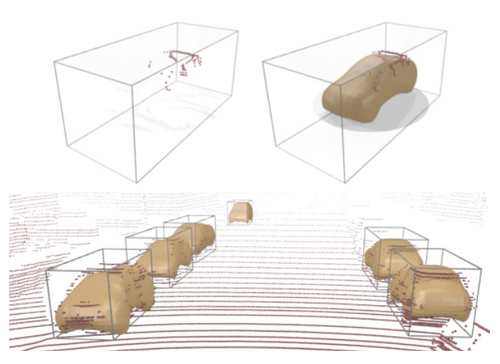 We first demonstrate that the marching cubes algorithm is not differentiable and propose an alternative differentiable formulation which we insert as a final layer into a 3D convolutional neural network. 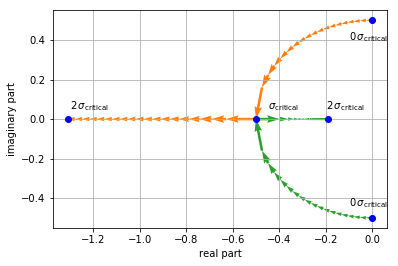 We further propose a set of loss functions which allow for training our model with sparse point supervision. Our experiments demonstrate that the model allows for predicting sub-voxel accurate 3D shapes of arbitrary topology. Additionally, it learns to complete shapes and to separate an object's inside from its outside even in the presence of sparse and incomplete ground truth. We investigate the benefits of our approach on the task of inferring shapes from 3D point clouds. Our model is flexible and can be combined with a variety of shape encoder and shape inference techniques. Schönberger, J., Pollefeys, M., Geiger, A., Sattler, T.
Robust visual localization under a wide range of viewing conditions is a fundamental problem in computer vision. Handling the difficult cases of this problem is not only very challenging but also of high practical relevance, eg, in the context of life-long localization for augmented reality or autonomous robots. In this paper, we propose a novel approach based on a joint 3D geometric and semantic understanding of the world, enabling it to succeed under conditions where previous approaches failed. Our method leverages a novel generative model for descriptor learning, trained on semantic scene completion as an auxiliary task. The resulting 3D descriptors are robust to missing observations by encoding high-level 3D geometric and semantic information. Experiments on several challenging large-scale localization datasets demonstrate reliable localization under extreme viewpoint, illumination, and geometry changes. Alhaija, H., Mustikovela, S., Mescheder, L., Geiger, A., Rother, C.
The success of deep learning in computer vision is based on the availability of large annotated datasets. To lower the need for hand labeled images, virtually rendered 3D worlds have recently gained popularity. Unfortunately, creating realistic 3D content is challenging on its own and requires significant human effort. 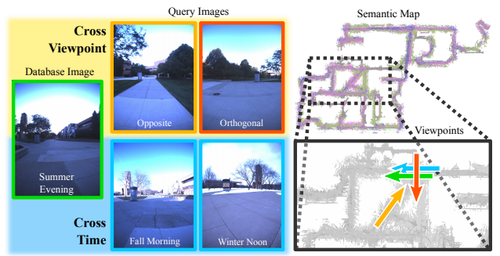 In this work, we propose an alternative paradigm which combines real and synthetic data for learning semantic instance segmentation and object detection models. Exploiting the fact that not all aspects of the scene are equally important for this task, we propose to augment real-world imagery with virtual objects of the target category. Capturing real-world images at large scale is easy and cheap, and directly provides real background appearances without the need for creating complex 3D models of the environment. We present an efficient procedure to augment these images with virtual objects. In contrast to modeling complete 3D environments, our data augmentation approach requires only a few user interactions in combination with 3D models of the target object category. Leveraging our approach, we introduce a novel dataset of augmented urban driving scenes with 360 degree images that are used as environment maps to create realistic lighting and reflections on rendered objects. We analyze the significance of realistic object placement by comparing manual placement by humans to automatic methods based on semantic scene analysis. This allows us to create composite images which exhibit both realistic background appearance as well as a large number of complex object arrangements. Through an extensive set of experiments, we conclude the right set of parameters to produce augmented data which can maximally enhance the performance of instance segmentation models. 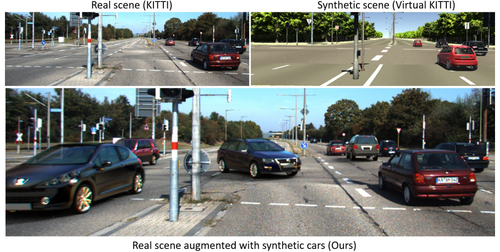 Further, we demonstrate the utility of the proposed approach on training standard deep models for semantic instance segmentation and object detection of cars in outdoor driving scenarios. We test the models trained on our augmented data on the KITTI 2015 dataset, which we have annotated with pixel-accurate ground truth, and on the Cityscapes dataset. Our experiments demonstrate that the models trained on augmented imagery generalize better than those trained on fully synthetic data or models trained on limited amounts of annotated real data. Ambron, E., Miller, A., Kuchenbecker, K. J., Buxbaum, L. J., Coslett, H. B.
Koc, O., Maeda, G., Peters, J.
Schoeller, F., Eskinazi, M., Garreau, D.
Which Training Methods for GANs do actually Converge? Mescheder, L., Geiger, A., Nowozin, S.
Recent work has shown local convergence of GAN training for absolutely continuous data and generator distributions. In this paper, we show that the requirement of absolute continuity is necessary: we describe a simple yet prototypical counterexample showing that in the more realistic case of distributions that are not absolutely continuous, unregularized GAN training is not always convergent. Furthermore, we discuss regularization strategies that were recently proposed to stabilize GAN training. Our analysis shows that GAN training with instance noise or zero-centered gradient penalties converges. On the other hand, we show that Wasserstein-GANs and WGAN-GP with a finite number of discriminator updates per generator update do not always converge to the equilibrium point. We discuss these results, leading us to a new explanation for the stability problems of GAN training. Based on our analysis, we extend our convergence results to more general GANs and prove local convergence for simplified gradient penalties even if the generator and data distributions lie on lower dimensional manifolds. We find these penalties to work well in practice and use them to learn high-resolution generative image models for a variety of datasets with little hyperparameter tuning. Nishiyama, Y., Kanagawa, M., Gretton, A., Fukumizu, K.
Kernel Bayesian inference is a powerful nonparametric approach to performing Bayesian inference in reproducing kernel Hilbert spaces or feature spaces. In this approach, kernel means are estimated instead of probability distributions, and these estimates can be used for subsequent probabilistic operations (as for inference in graphical models) or in computing the expectations of smooth functions, for instance. Various algorithms for kernel Bayesian inference have been obtained by combining basic rules such as the kernel sum rule (KSR), kernel chain rule, kernel product rule and kernel Bayes' rule. However, the current framework only deals with fully nonparametric inference (i.e., all conditional relations are learned nonparametrically), and it does not allow for flexible combinations of nonparametric and parametric inference, which are practically important. Our contribution is in providing a novel technique to realize such combinations. We introduce a new KSR referred to as the model-based KSR (Mb-KSR), which employs the sum rule in feature spaces under a parametric setting. Incorporating the Mb-KSR into existing kernel Bayesian framework provides a richer framework for hybrid (nonparametric and parametric) kernel Bayesian inference. As a practical application, we propose a novel filtering algorithm for state space models based on the Mb-KSR, which combines the nonparametric learning of an observation process using kernel mean embedding and the additive Gaussian noise model for a state transition process. While we focus on additive Gaussian noise models in this study, the idea can be extended to other noise models, such as the Cauchy and alpha-stable noise models. Osa, T., Peters, J., Neumann, G.
Peharz, R., Vergari, A., Stelzner, K., Molina, A., Trapp, M., Kersting, K., Ghahramani, Z. Song, J., Andres, B., Black, M., Hilliges, O., Tang, S.
Singh, A., Jahnke, T., Wang, S., Xiao, Y., Alapan, Y., Kharratian, S., Onbasli, M. C., Kozielski, K., David, H., Richter, G., Bill, J., Laux, P., Luch, A., Sitti, M.
Wang, W., Kishore, V., Koens, L., Lauga, E., Sitti, M.
We study connections between ordinary differential equation (ODE) solvers and probabilistic regression methods in statistics. We provide a new view of probabilistic ODE solvers as active inference agents operating on stochastic differential equation models that estimate the unknown initial value problem (IVP) solution from approximate observations of the solution derivative, as provided by the ODE dynamics. 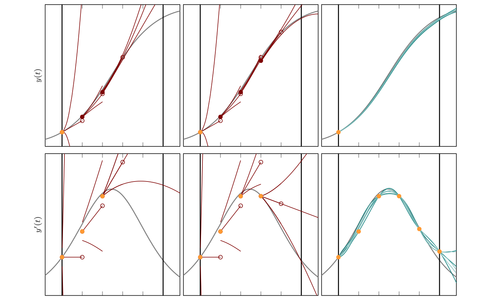 Adding to this picture, we show that several multistep methods of Nordsieck form can be recast as Kalman filtering on q-times integrated Wiener processes. Doing so provides a family of IVP solvers that return a Gaussian posterior measure, rather than a point estimate. We show that some such methods have low computational overhead, nontrivial convergence order, and that the posterior has a calibrated concentration rate. Additionally, we suggest a step size adaptation algorithm which completes the proposed method to a practically useful implementation, which we experimentally evaluate using a representative set of standard codes in the DETEST benchmark set. 3D shape completion from partial point clouds is a fundamental problem in computer vision and computer graphics. Recent approaches can be characterized as either data-driven or learning-based. Data-driven approaches rely on a shape model whose parameters are optimized to fit the observations. Learning-based approaches, in contrast, avoid the expensive optimization step and instead directly predict the complete shape from the incomplete observations using deep neural networks. However, full supervision is required which is often not available in practice. In this work, we propose a weakly-supervised learning-based approach to 3D shape completion which neither requires slow optimization nor direct supervision. While we also learn a shape prior on synthetic data, we amortize, ie, learn, maximum likelihood fitting using deep neural networks resulting in efficient shape completion without sacrificing accuracy. 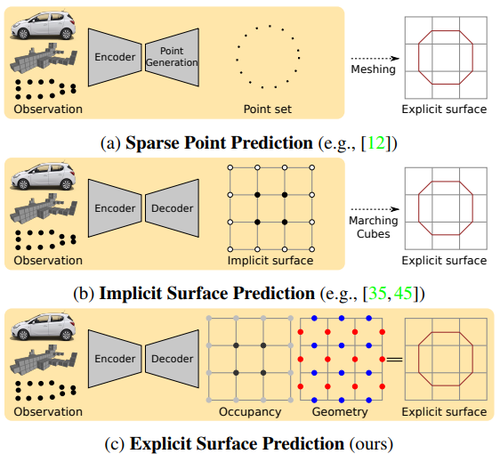 Tackling 3D shape completion of cars on ShapeNet and KITTI, we demonstrate that the proposed amortized maximum likelihood approach is able to compete with a fully supervised baseline and a state-of-the-art data-driven approach while being significantly faster. On ModelNet, we additionally show that the approach is able to generalize to other object categories as well. One of the challenges of this century is to understand the neural mechanisms behind cognitive control and learning. Recent investigations propose biologically plausible synaptic mechanisms for self-organizing controllers, in the spirit of Hebbian learning. In particular, differential extrinsic plasticity (DEP) [Der and Martius, PNAS 2015], has proven to enable embodied agents to self-organize their individual sensorimotor development, and generate highly coordinated behaviors during their interaction with the environment. These behaviors are attractors of a dynamical system. 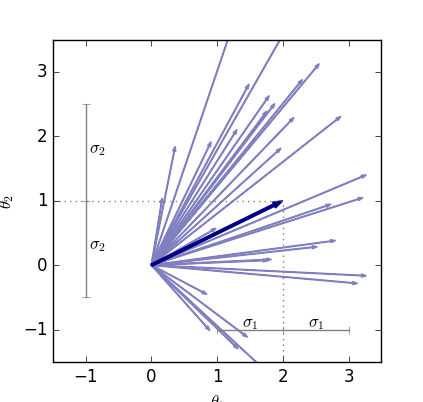 In this paper, we use the DEP rule to generate attractors and we combine it with a “repelling potential” which allows the system to actively explore all its attractor behaviors in a systematic way. With a view to a self-determined exploration of goal-free behaviors, our framework enables switching between different motion patterns in an autonomous and sequential fashion. Our algorithm is able to recover all the attractor behaviors in a toy system and it is also effective in two simulated environments. A spherical robot discovers all its major rolling modes and a hexapod robot learns to locomote in 50 different ways in 30min. Safavi, S., Panagiotaropoulos, T., Kapoor, V., Logothetis, N. K., Besserve, M.
Šošić, A., Rueckert, E., Peters, J., Zoubir, A., Koeppl, H.
Veiga, F., Peters, J., Hermans, T.
Vankadara, L., von Luxburg, U.
Kellmeyer, P., Grosse-Wentrup, M., Schulze-Bonhage, A., Ziemann, U., Ball, T.